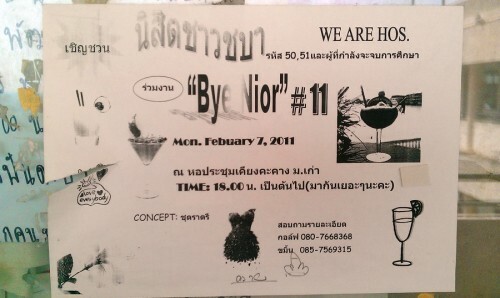 “Bye Nior” is a common Tinglish (Thai English) term meaning “graduation party” (goodBYE to the seNIORs)., which this flyer posted on a window at Maha Sarakham University is apparently advertising. As for the hos, I think they are trying to convey that they will be our hosts/hostesses. So, does anyone want to go to a graduation party with a bunch of hos? Next PostNext doncha wanna come home?